I think we’ve all experienced the well-meaning but often misguided armchair marketer. I can’t be the only one who has had to bite her tongue at, “I like to make my own posters in Publisher.” Or “I do a bit of writing myself.” You don’t say? Look, it’s great you took a design class in college. So did I, but I’m not a designer. Just like psychology 101 doesn’t make me a psychologist. The area of marketing and communications that is now the worst for this phenomenon is social media. Everyone and their mom and grandma has Facebook. 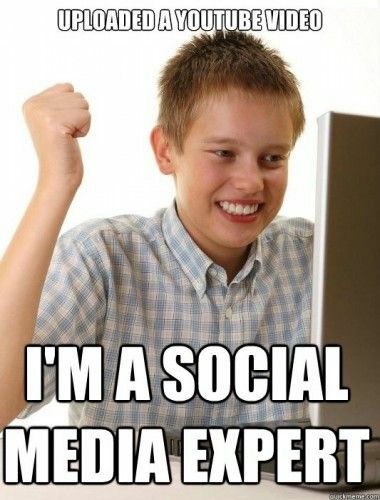 It’s pretty rare now to find someone without any experience in social media. Technically, it’s true. Anyone can set up a social media profile. But my first question is always, “Who are you trying to reach?” Which, as you all already know, is the first question you ask regardless of the tactic you’re using. None of us start with the final product. We don’t buy a billboard and then figure out who should see it and what it should say. We start with our audience, tailor the message we want to deliver and only then decide on the best way (or ways) to get it to our audience. Social media is a great tool (or really set of tools), and no marketing plan now should be without a social component. And it’s changing pretty constantly. That’s why I love hearing how others are utilizing it to strengthen their brands and interact with their customers. Our October program from Silverwood will be fascinating for that very reason. But most people aren’t spending their time researching new social media platforms or reading case studies of successful social media campaigns. They don’t think about what it will take to create compelling content and how much time is needed to keep it up to date. They don’t realize it’s not really free. Oftentimes you will have to spend money to get any eyes on your content. They also don’t consider how they will measure success. I get it, marketing and communications can be the fun stuff. However, there is science behind this art. It also takes talent, skill and strategy. And it’s best left to the experts.